In July 1990 a cruise line was introduced that set completely new standards concerning water-borne holidays. Up until that time if you wanted the ultimate in luxury on a sea going trip you either booked a suite on a multi-class liner such as the now taken out of service QE II, or went for a small exclusive vessel that lacked the facilities of a big ship. Crystal Cruises was the new kid on the block and has been winning awards ever since. Like a fine wine it has matured over the years. It is different and continues that way. Crystal Cruises is part of NYK, Japanese, and one of the world’s largest shipping companies. However it is run as an entirely American operation, based in Los Angeles and only offers two ships, Crystal Symphony and Crystal Serenity. Symphony and Serenity are big liners by any stretch of the imagination, 50,000 tons (plus) each, around 1,000 passengers and 650 crew. Even those in the cheapest cabins live the life of six-star extravagance with virtually every possible luxury available. The nightly shows in the theatre are at least the equal of London’s West End with regular appearances by international stars in that venue and also in the equally comfortable nightclub. The cuisine in one of four restaurants is superb and nothing seems too much for the willing staff to accommodate. In August Symphony visits Dover prior to circumnavigating the UK calling at Edinburgh, Belfast, Liverpool, Dublin, Waterford and Guernsey. Have a word with your travel agent. He may well be able to arrange a short visit. 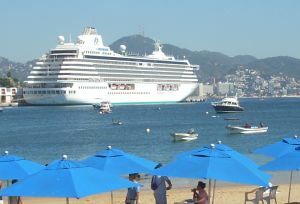 Crystal Serenity is based in the Mediterranean this summer prior to a southern transatlantic transit to the Caribbean in November. Serenity is the slightly larger of the two. It has recently undertaken a multi-million dollar re-modelling including a redesigned atrium area in the centre of the ship and a revised casino. 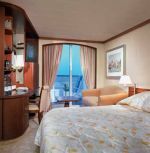 While most cruise lines have been increasing the size of their cruise ships, Crystal has actually decreased Serenity’s guest capacity by converting 12 deluxe staterooms with verandas to eight Penthouse staterooms. Crystal Serenity’s 72 richly appointed 403sq ft penthouses boast a personal butler service, large private veranda, sizeable living area, bar stocked with complimentary wine and choice of spirits, Jacuzzi® bath and separate shower, walk-in closet, flat screen television, DVD and CD player, Riedel glassware, and complimentary clothes pressing service. There are 32 even larger penthouse suites and four extremely lavish 1,345sq ft master suites. All standard cabins have a bath and offer 226sq ft of luxury accommodation. What do you get on a cruise with Crystal? Firstly no big unexpected bills to settle at the end of the cruise, all those niggling little items that some companies now add, copying perhaps Ryanair, well known for its hidden extras. Even the bus ride from the ship to town at each port is charged by some. True you have to pay for wines and spirits but soft drinks come courtesy of Crystal to all passengers, as does ice cream and a proper 24-hour room service. There is a champagne reception at the start and finish of every cruise. Yes you are billed for services in the magnificent spa but the computer, bridge, golf, electric organ and other courses on sea days are for the most part gratis and included in the package. The lecture courses are most compelling and the purpose-built cinema offers the latest releases. 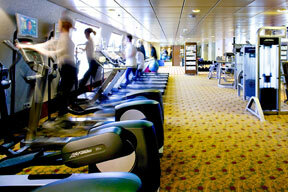 The gym is one of the best at sea on any size of ship. Both ships feature a sliding roof over one of the two swimming pools which in practice stays shut the whole time. This means that the ship offers an air conditioned aquatic area for lunchtime poolside buffets which in the evening becomes available for al fresco dining. Or you can go outside! 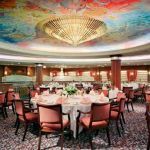 Even the two specialist eateries (one Italian and one Far Eastern) only add a very nominal USD7 per person gratuity for some of the finest meals possible at sea (or land). Crystal is not cheap, and refuses going for a policy of major discounts for the less than popular voyages. It is more discrete. This means that the ships are never crowded and the very high standards can be maintained. Towards the year’s end Symphony visits amongst many unique places in South America The Amazon, Rio de Janeiro, Buenos Aires, Port Stanley and Ushuaia. Prior to that it will be based in New York taking in Bar Harbor, St Johns, Quebec and Montreal. At the same time Serenity will make several passages of the Panama Canal, fascinating in itself, passengers joining in either Miami or Costa Rica.